First a disclaimer. I could probably sit on this site for another 3 months tinkering with it. There’s still a few bugs I know about that need to be fixed and a long list of improvements / added features I indeed to get to. However, after a little encouragement from some good friends I knew it was time to get it out in the open and see what people think of it. I’ll continue to improve it over the next few months but for now (I guess) I’m happy with it. Just before the New Year I decided it was time to redesign my site. Initially I planned to just make the old design responsive but the markup and CSS weren’t great (damn former me – although to be fair I was still learning CSS) and I didn’t really like the design that much anyway so decided it was time for a fresh start. I came up with a few ideas of how I wanted the site to work and sketched them down. However, when I tried to translate these ideas into designs they never quite looked as slick as they did in my head. During this time one of the designers at Fi, Tobias van Schnieder, had just moved from the Stockholm office to NYC. I explained my predicament to him, showed him my sketches and asked if I could pick his brain on design stuff once I had something half decent in Photoshop. The very next day, without me asking, he came in with designs for me! I loved the stuff Tobias came up with and you can see from the screenshots below that the final site changed very little from his original designs. A couple of people I spoke to thought it was a little strange that, being a web developer, I didn’t design my own site. However, I have to disagree. Let me put it this way, if I was going to build my own house I’d get an architect to design it otherwise I’d end up living somewhere like this. One of the main requirements for my site, which I think Tobias got spot on, was that I needed something to look great but I don’t necessarily have lots of nice images that I can use. Plus prepping graphics for a blog post takes time and might put me off adding content. I was worried that without images my blog would just look plain and boring but, with the colors, I think it looks great! Another great thing about the designs is that all my old blog posts from over the past few years fit nicely with minimal work required to integrate them. Whether they should all still be here is another debate and I may well delete some of the older, now irrelevant posts. I think the thing that finally pushed me over the edge is that since LinkedIn added the endorsements feature people keep endorsing me for Flash related skills! I don’t do Flash anymore, stop endorsing me for it! So a huge thanks to Tobias for the awesome designs and also for keeping me motivated and pushing me to get the site to the point it is today. Also, some appreciation to my girlfriend Junith who’s been patient over the past month whilst I’ve spent many evenings putting this site together. All the late nights reminded me of why I stopped doing freelance on the side many moons ago. Now I need to start writing regularly to make all the work worthwhile! I’m planning a series of posts about stuff I’ve learnt whilst making the site so watch this space. Desige is great,I love it. Site design is great! Each slides gives new posts. But how to go for specific one. Any navigation other than sliding mean moving directly to a specific post. Really love this site. A great example of “plain design” with amazing and seamless interaction. It’s amazing! I like it! Looking at your site makes me want to move to NYC and work with you! Thank you so much for sharing, and giving us a cool site to play around with. You’ve got a brilliant website. Well done! Wicked stuff man! The future is now. Your site looks awesome. The colors do make it engaging and it is fun to look around. Think you did a great job! Props to you! Thanks everyone for such positive comments! I plan on posting more on how I build the site when I get some time. @Monty – Thanks for the tip. I plan on doing some updates on the site soon and have a few little bugs to fix too. Great job with the new site! Looks awesome! 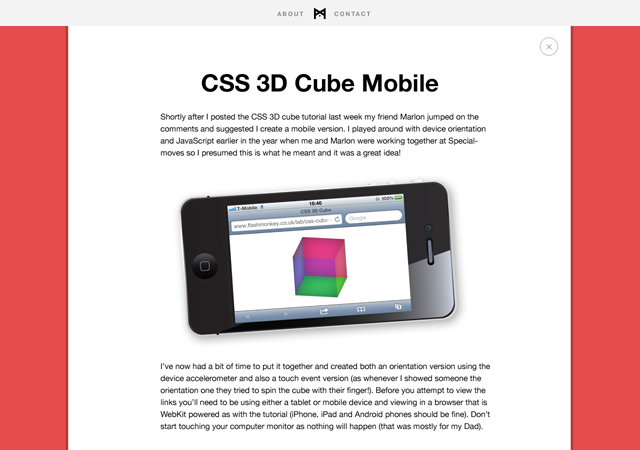 very nice modern site steve.. light, fluid and degrades nicely to mobile too.. have you got some links to good resources to learning stuff like the page transitions? minor point but i recommend bundling your scripts and css server side to reduce your http requests. You’ve knocked your socks off with this website. I absolutely love the new design. The animations are very smooth and the responsiveness transitions exceptionally well, especially with such simple navigation. Great work! I’m really loving the design and approach! Well done! All best in NY in FI. Got my eyes on the first sight! A unique design. Wow!! This is one the best minimal, responsive and absolutely stunningly beautiful website I have ever seen!! Its damn colorful too!! I just love it!! 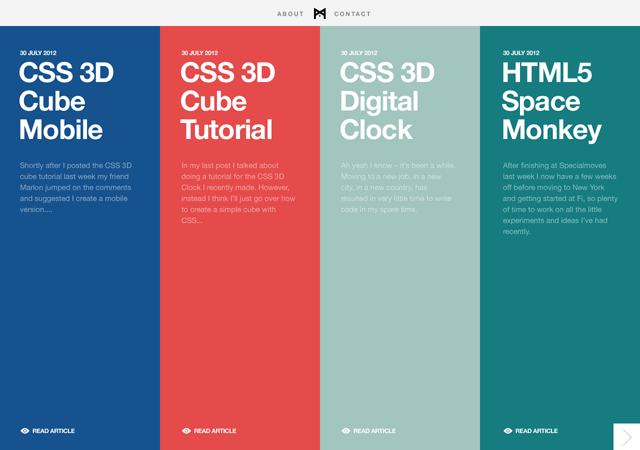 Would it be right if I took some inspiration from this awesomely amazingly designed website? Wow.. 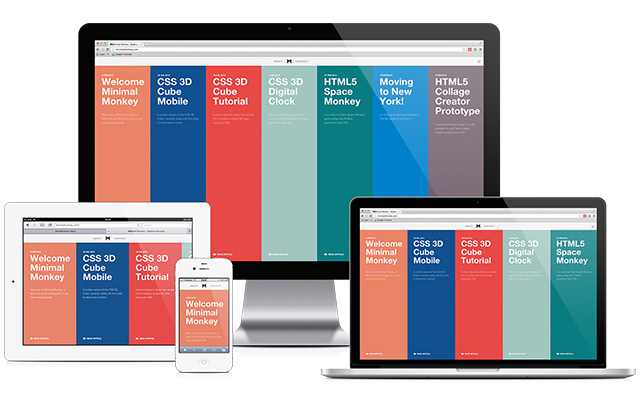 The most interesting responsive style I have ever seen. Great design. Great work. Outstanding site – awesome work Steve! Absolutely Beautiful! Colors are fantastic and I love how minimal it is. Even your old man managed to navigate the site, so it must be user friendly. Well done mate. Beatiful design and interaction — love it. I’m so mad that you have this design and not me. Blargh, it’s so unbelievably beautiful. Top job mate, really love it. Inspiring me to finally make my site! Fresh! soft colors, easy to read, smooth animations….Great job Mister! Really digging the site! Love all the animations and even the tutorials on here! Will be visiting on a regular basis to keep up to date on what you’re doing! New design and functionality is all wonderful – it took some playing around to really appreciate it. Like the arrows left/right on single posts to navigate, or the small ( x ) in the top right to take me home. Feels more like an app and less like a site, well done! Holy flying monkeys! This site is great. Love the silky-smooth transitions/animations. Please do a blog post on your development process! This is an amazing piece. I pretty much love every piece of it. The only thing is that horizontal scrolling doesn’t make good friends with Wacom pan/scroll.